Do you like Ho Chi Minh? 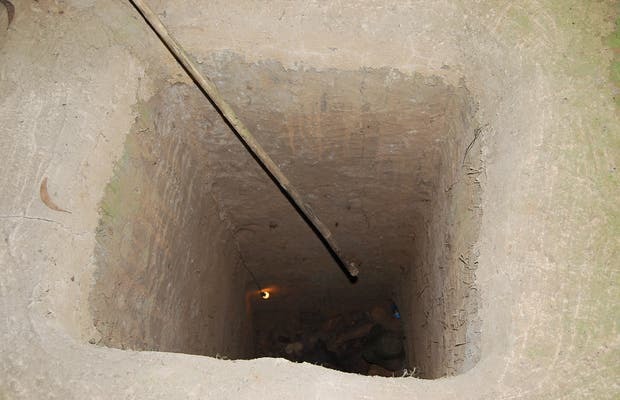 During the Vietnam War, these tunnels played an important role in the defense of the people against the Americans. A good example of how victory in war doesn't necessarily need superior technology. In these tunnels, anthill-style settlements sprung up, complete with hospitals, kitchens, markets, dormitories, etc. The tunnels were dug simply using shovels, and were perfectly camouflaged among the vegetation of the area, so Americans set up their bases right above without realizing that the Vietnamese were below them, coming at night to steal food and supplies. Cool to experience the history and get in the tunnels but nothing exciting or outstanding.